Wave Carver colt continues to improve and posts another impressive victory. ALTOONA, IA�OCTOBER 27, 2012�In late May of this year, Ultimate Wave had made only two career starts and banked less than $500 without hitting the board. 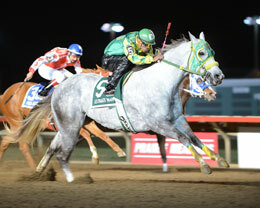 Some five months later, the Wave Carver colt is now a multiple stakes winner with a six-figure bankroll after blitzing the field in the $200,000 Adequan Derby Challenge Championship (G1) at Prairie Meadows. Bet down to be the 6-5 favorite, Ultimate Wave and jockey Esgar Ramirez broke from post five and quickly took command before hitting the wire 1 � lengths in front with a 400-yard time of :19.563. Jorge Miranda trains the Texas-bred for owner Junior�s Quarter Horses Inc.
A veteran of only five career starts, Ultimate Wave broke his maiden in a trial to the Adequan Arapahoe Derby Challenge and then came by to win the final by 2 � lengths. His three victories in the Challenge program have earned him more than $115,000. Bred by Keilani Farms, Ultimate Wave is out of the Grade 1-winning millionaire Eye For Corona. Her four starters are all winners. Fols Jesse, Jess A Comment, Exciting The Planet, Second Painted Sign, Attack The Cartel, Painted Lies and Special Awards completed the order of finish.